Card of the Day ~God is in Charge~ This card comes to you with the reassuring message that God is in charge, taking care of all the details. Give any worries to God, and stop struggling against the flow. There’s a natural course that this situation is taking, and it’s important to trust that things are going in the right direction...because they are. Most of us have a difficult time having faith or trust because the path is long and difficult however; there is always light at the end of the tunnel. 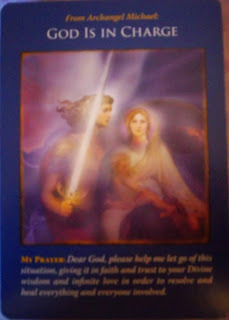 If you are struggling call on God and the Angels to buoyant your faith and give you the energy to keep going forward. Remember you are always where you should be in life at all times and if your intuition gives you a strong feeling to change, that is the traffic sign saying “Turn Right Here”. Have a fantastic day. I love you all!